Frank Castle is always at his best when he’s settling the common street debt. The Punisher is fun when he’s taking on big bads, but he’s at his most fun when he sees crime on the street and steps in to save the citizens of New York. That’s exactly what this book provides to the reader. 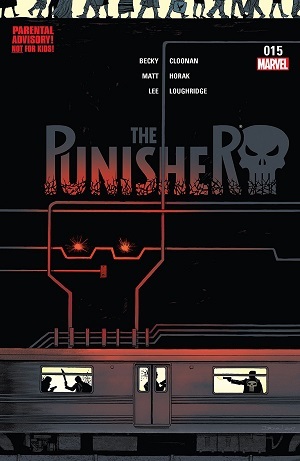 The Punisher stepping in to stop a serial killer from throwing citizens in front of trains. Writer Becky Cloonan continues to prove that she has a handle on Frank and his personality. The Punisher isn’t an easy or pleasant character to write. There’s an element of depravity that surrounds the character and Cloonan has to tap into an unforgiving, unrelenting, and violent side of herself, if such a side even exists. 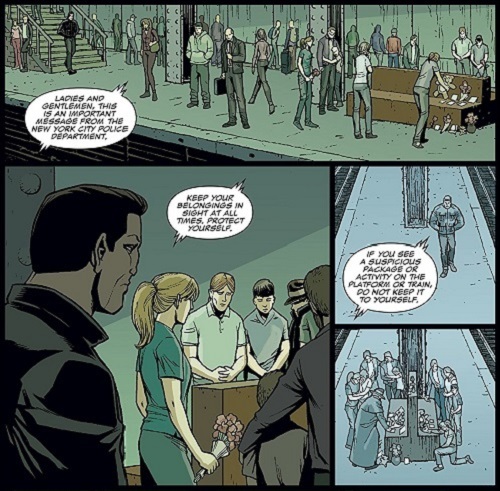 Garth Ennis touched on this in Welcome Back, Frank in his thesis on defending the actions of The Punisher. Cloonan has it mastered. 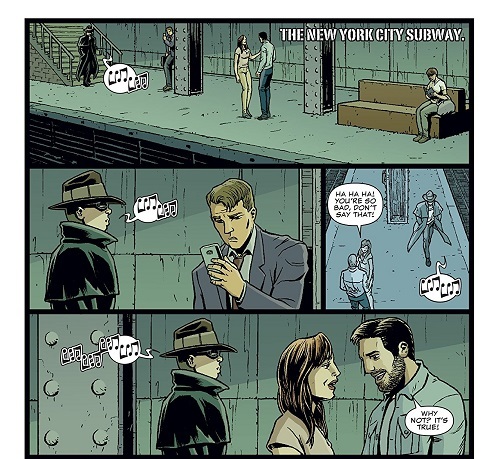 Plot: A man in a trench coat is patrolling the subway and looking for people to shove in front of the oncoming trains. 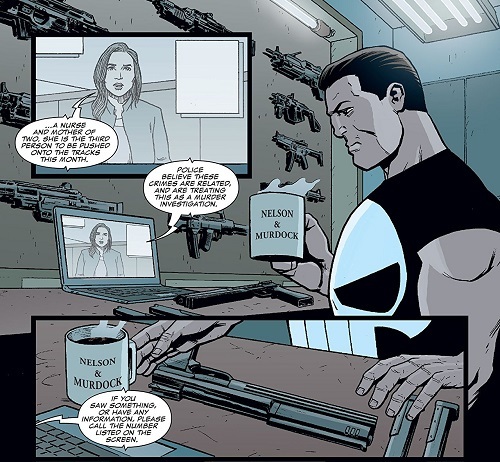 The Punisher hears about these crimes while listening to a newscast and decides it is time to jump into action. He soon finds out that the killer was baiting The Punisher and nearly kills him the same way he’s killed everyone else. Frank escapes, but realizes the man has been living among homeless people and puts a plan into action. Using a former lieutenant who is currently a vagrant, Frank lures the serial killer into a trap. Castle pretends to be a vagrant and stands next to a high society woman. She mentions that the world would be a better place without the homeless. The killer tries to oblige her only to find out it’s Frank in disguise. Just as the killer tries to take the woman hostage, the homeless lieutenant pops out of the train to knock him down and send him running. Castle shoots him in the leg, the train runs him over, and the lieutenant receives the credit for stopping the killer, which is fine with Frank. The lieutenant gives Frank a shout-out during a TV interview and that’s good enough for Frank, who sips his coffee and salutes him back. Story: Cloonan is a gift to The Punisher. Not only does she understand Frank and his makeup, she also truly understands his mentality. Frank has a long and storied history, much of it provides the fabric of his being. In order to write The Punisher, the person must understand what makes him tick. Here is where Cloonan stands out and shines. Each arc and one-off has been vibrant, full of life, and plenty full of death. These stories add to the legacy of The Punisher. This story is fitting for Castle. It could have been developed into an arc, but making it a one-shot worked for this story. The only thing lacking in this story is the backstory for our killer. The reader is never really informed as to why this person has a thing for pushing people off trains. It’s not necessarily needed for a story involving The Punisher, but it would have made the story a bit more tidy. It was still a great story for an easy one-off. Art: The art continues to change with The Punisher, but I’m not sure the current ticket of Matt Horak and Lee Loughridge is the way to go. Frank looks a little off for my tastes. The book is fine, but The Punisher does not look right. There is a close-up with Frank holding a massive gun and he looks more like a villain than a protagonist. It just doesn’t work. The setting, ancillary characters, and surroundings look fine. It’s just Frank that doesn’t work, but it’s not so awful that it takes away from the experience. It’s just something that would look a little better if it changed, in my opinion.